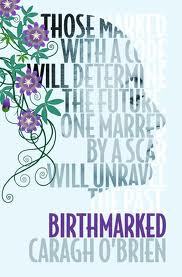 I loved the cover of Birthmarked as soon as I saw it - and in this case - you can judge a book by its cover! Gaia lives in a future world scarred by the climate changes caused by the previous peoples. A world where your future is decided by whether you live inside the walls of the enclave or outside it. Those on the inside lead a life of privilege and ease. Outside is poverty, sacrifice and hard-work. Gaia lives on the outside. And one night she comes home from her work as a midwife to find that her parents have been taken away. Gaia sets out to unravel the mystery of their disappearance. A journey that becomes more dangerous as she delves into things that the people in power want to keep secret - at any cost. And of course there is the obligatory love interest just to keep things sweet! I couldn't put this book down. Imagine my delight when I recently discovered that book 2 'Prized' is due out November 2011 and that O'Brien plans to write a third (check out the web link below). If you loved 'Hunger Games', then you should enjoy this one too.